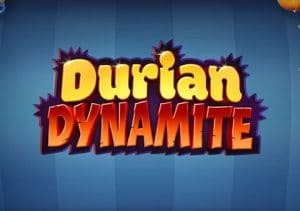 Durian Dynamite is a super volatile take on the classic fruit machine. Created by Quickspin, it’s a 5 reel, 20 payline video slot that comes with special durian symbols that can blast onto the reels and turn multiple positions wild. There’s also a free spins round where the wild extras hit more regularly. Play on you PC, tablet or mobile from between 20p and £100 per spin. Quickspin has kept things pretty simple on the design front. The setting is some kind of fruit factory where the symbols are dropped onto the reels via tubes. Joining the royal values are cherries, grapes, plums and oranges. The top payer is the melon. Land 3, 4 or 5 of these on a payline for a payout of 0.75, 7.5 or 25 times your total bet. The durian fruit (supposedly the smelliest fruit in the world) is the wild. This substitutes for all of the standard symbols as well as delivering payouts of 2.5, 10 or 25 times your stake per payline. Look out for the red funnel that can appear over reel 3 on any spin as this means the Dynamite feature is on its way. If a dynamite wild symbol hits here, the durian fruits will explode around the reels to turn multiple positions wild. If a dynamite wild and durian land together, a split occurs which creates even more potential wilds. The main bonus round, the Free Spins feature, is triggered by landing the bonus scatter on reels 2, 3 and 4 on the same spin. You’ll be awarded a minimum of 6 free spins. Before they begin, there’s a pick me round. You’ll have between 3 and 6 opportunities to add more free spins to your total, activate more dynamite reels or add more wilds when you do trigger the Dynamite feature. There’s up to 30 extra free spins to be won taking your total to 36 potentially. The Free Spins feature is where the best winning chances occur thanks to the wild extras in play. Don’t expect to land the feature that often though. This is a high variance game so you’ll likely endure some lengthy spells when your bankroll heads south. Trigger the free spins and then get lucky with your picks and Durian Dynamite can really live up to its name though – you can win 2,515.25 times your bet on every spin/free spin too. If you like video slots based on fruits, Berryburst MAX from NetEnt is worth playing.